Camille Claudel (December 8, 1864 – October 19, 1943) was a French sculptor and graphic artist who produced a number of noteworthy works until mental illness resulted in her being institutionalized, against her will, in an asylum in 1913. The older sister of the French poet and diplomat Paul Claudel, she was the student of Alfred Boucher and then Auguste Rodin. She and Rodin had a tumultuous love relationship for eight years. After the affair ended, Claudel continued to work with Rodin for another six years. Her relationship with Rodin placed her under his shadow, and the value of her art was not recognized separately during her lifetime. However, she is now recognized as a brilliant sculptor in her own right. 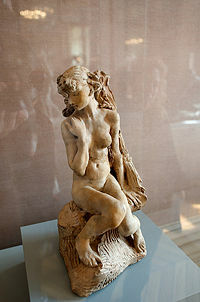 Claudel's early work is similar to Rodin's in spirit, but shows a unique and distinct imagination and lyricism. This is particularly evident in the Bronze Waltz (La Valse, 1892). She worked in marble, terracotta, plaster, onyx, and bronze. After a miscarriage, a possible abortion, and finally Rodin's deciding not to separate from the mother of his son, Claudel began to work independently. However, depression and later more drastic forms of mental illness caused her family to have her committed to an asylum for the insane. Her mother, who continuously opposed Claudel's artistic work, thwarted all medical efforts to allow Claudel's return to society. After 30 years Claudell died in a mental asylum. Claudel destroyed much of her work before she entered the asylum, but some 90 fine works remain, allowing her to be recognized as a truly gifted artist. Camille Claudel was born in Fère-en-Tardenois, Aisne—northern France—in 1864, the child of a family of farmers and gentry. Her father, Louis Prosper, dealt in mortgages and bank transactions. Her mother, the former Louise Athanaïse Cécile Cerveaux, came from a Champagne family of Catholic farmers and priests. The family moved to Villeneuve-sur-Fère while Camille was still a baby. 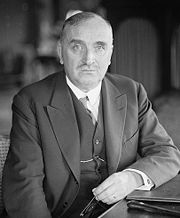 Her younger brother, Paul Claudel, was born there in 1868. Subsequently her family moved to Bar-le-Duc (1870), Nogent-sur-Seine (1876), and Wassy-sur-Blaise (1879), although they continued to spend summers in Villeneuve-sur-Fère. The stark landscape of that region made a deep impression on the children. Camile was fascinated with stone and soil as a child and demonstrated talent in clay modeling at an early age. Her father sought to afford her an opportunity to study art, and he sent her to study at the Académie Colarossi, one of the few art academies open to women. Camille, thus, moved with her mother, brother, and younger sister to the Montparnasse area of Paris in 1881, her father having to remain behind, working to support them. At the Académie Colarossi, Claudel studied with sculptor Alfred Boucher. In 1882, she rented a workshop with other young women, mostly English, including Jessie Lipscomb. In 1883, she met Auguste Rodin, who taught sculpture to Claudel and her friends. Around 1884, she started working in Rodin's workshop, where he initially influenced her to move away from the classical toward a more natural style of sculpture. Claudel became his source of inspiration, his model, his confidante, and lover. His work became more simple and clear, with an elegance not evident before, while her work became more and more sensual as their relationship developed. When they broke apart from time to time, her sculptures took on an even more intense quality. She never lived with Rodin, who was reluctant to end his 20-year relationship with Rose Beuret, nor did Claudel have children with Rodin. However, she did become pregnant with his child, but she lost in an accident, which sent her into a deep depression. Knowledge of the affair agitated her family, especially her mother, who never completely agreed with Claudel's involvement in the arts. As a consequence, Claudel left the family house in Paris. In 1892, perhaps after an unwanted abortion, Claudel ended the intimate aspect of her relationship with Rodin, although they continued to see each other regularly until 1898. 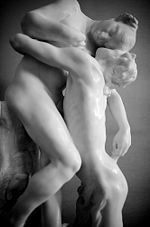 He said of her, “I showed her where she would find gold, but the gold she finds is her very own.” Some say that Rodin became jealous of Claudel's talent, which caused considerable friction between them. 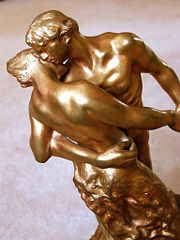 A gilded version of the Bronze Waltz (La Valse). When she broke with Rodin, she began to produce her most personal and revolutionary works. 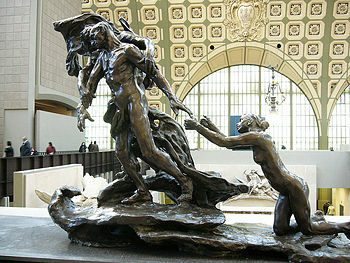 Beginning in 1903, Claudel exhibited her works at the Salon des Artistes français and at the Salon d'Automne. She showed herself to be brilliant sculptor in her own right. According to art critic Octave Mirbeau, she was "A revolt against nature: A woman genius." The most famous of her early works is the Bronze Waltz (1892), which shows a high degree of imagination and lyricism. Her onyx and bronze small-scale Wave (1897) was a conscious move away from the style of her Rodin period, with a decorative quality quite different from the "heroic" feeling of her earlier work. The Age of Maturity (L'Age Mûr, 1895-1913), has been interpreted as a powerful allegory of her break with Rodin. One figure in L'Age Mûr, The Implorer (the young woman), was later produced as a separate edition on its own—a raw, pure, and honest work. Camille knew many of the other artists who were working in Paris at the time, and was even Claude Debussy's fiancée for a while. In the early years of the twentieth century, Claudel had patrons, dealers, and commercial success. However, this support began to wane, as she found little acceptance after her break with Rodin and suffered in increasing isolation and poverty. Although she continued to be plagued with depression, her mental illness did not affect Claudel's genius. Her masterwork, L'Age Mûr, is thought by some to be a representation of Claudel's grief which "represents Camille, naked, begging Rodin to stay with her while he walks away, wrapped in the arms of an old lady with vulture-like features—Rose (his wife). This scene, which really took place, summarizes the climate of their relationship and the tragedy lived by Camille who could never supplant Rose." However, in another interpretation, this sculpture represents the move from youth to old age as an allegory of time passing by, hence the title, The Age of Maturity, with life being the man moving away from "youth," the young girl, toward the old woman who is "old age." In either case, this sculpture reveals her unique understanding of movement, also captured in La Valse. It shows her powerful ability to transmit emotions. In this expressive power her artistic talent is more modern than that of Rodin, a more classical sculptor, thus making her an avant-garde sculptor in her time, who remained basically unrecognized until the twentieth century. Along with L'Age Mûr she produced a number of other "angry works," includingClotho (Fate, 1893) and Perseus and The Gorgon. Rough, with almost an ugliness and malefic quality, these sculptures no longer reflect anything from Rodin. From 1905 on, Claudel began to act mentally deranged. She destroyed many of her statues, disappeared for long periods of time, and acted paranoid, accusing Rodin of stealing her ideas and of leading a conspiracy to kill her. He brother supported Camille financially until 1906, but after his wedding in that year, followed by his return to China, she lived secluded in her workshop. Her father, who approved of her career choice, also tried to help her and supported her financially. When he died on March 2, 1913, her mother did not inform Camille. On March 10, at the initiative of her brother, she was admitted to the psychiatric hospital of Ville-Évrard in Neuilly-sur-Marne. The admission form read that she had been "voluntarily" committed, although her admission was signed by a doctor and her brother. In 1914, to be safe from advancing German troops, the patients at Ville-Évrard were at first relocated to Enghien. On September 7, Camille was transferred with a number of other women to the Montdevergues Asylum at Montfavet, six kilometers from Avignon. Her certificate of admittance to Montdevergues, signed on September 22, 1914, reported that she suffered "from a systematic persecution delirium mostly based upon false interpretations and imagination." Some historians speculate that her brother, also an artist, felt overshadowed by her strength in art and wanted her out of the way. Records show that while she did have mental outbursts, she was clear-headed while working on her art. Moreover, doctors tried to convince the family that she need not be in the institution. For a while, the press accused her family of forcing a sculptor of genius into the asylum without good cause. Meanwhile, her mother forbade her to receive visits or even mail from anyone other than her brother. As the years wore on, the hospital staff regularly proposed to her family that Claudel be released, but her mother refused each time. Paul Claudel visited her every few years, but in conversations with friends he referred to her in the past tense. Her mother died on June 20, 1929. Only after her mother's death, could her friend, Jessie Lipscomb, visit her. Camille Claudel died on October 19, 1943, after having lived 30 years in the asylum at Montfavet, without ever having received a visit from her mother or sister. Her body was interred in the cemetery of Monfavet. Though Claudel destroyed much of her art work, about 90 statues, sketches, and drawings survive. In 1951, her brother organized an exhibition at the Musée Rodin, which continues to display her sculptures, as does the Musée d'Orsay, both in Paris. A large exhibition of her works was organized in 1984. The publication of several biographies in the 1980s sparked a resurgence of interest in her work. Her affair with Rodin was the basis for a play by Henrik Ibsen, When We Dead Awake (1899), and the motion picture Camille Claudel was made about her life in 1988. Co-produced by Isabelle Adjani, starring herself as Claudel and Gérard Depardieu as Rodin. In 1989, the film was nominated for two Academy Awards. The play Camille Claudel was produced as a musical by Goodspeed Musicals at The Norma Terris Theater in Chester, Connecticut, in 2003. 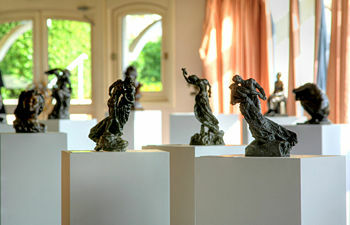 In 2005, a large art display featuring the works of Rodin and Claudel was exhibited in Quebec City and Detroit, Michigan. In 2008, the Musée Rodin organized a retrospective exhibition including more than 80 of her works. Ayral-Clause, Odile. Camille Claudel: A Life. Harry N. Abrams, 2002. ISBN 978-0810940772. Delbée, Anne, and Carol Cosman (trans.). 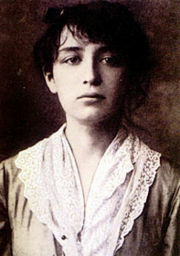 Camille Claudel: Une Femme. San Francisco: Mercury House, 1982. Mercury House, 1992. ISBN 978-1562790264. Lenormand-Romain, Antoinette, Auguste Rodin, and Camille Claudel. Camille Claudel & Rodin: Fateful Encounter. Gingko Press, 2005. ISBN 978-2850259999. Mirbeau, Octave. Combats Esthétiques. Pierre Michel, Jean-François Nivet, Éds. Paris, Nouvelles Éditions Séguier, 1993. ISBN 9782840490104. Paris, Reine-Marie, and Liliane Emery Tuck (trans.). Camille: The Life of Camille Claudel, Rodin's Muse and Mistress. Little Brown & Co, 1989. ISBN 978-1559700252. This page was last modified on 7 January 2017, at 16:15.